3-day/3-night dive trip on board the Vision dive boat to Santa Barbara Island and the northern islands of the Channel Island Marine Sanctuary. NCRD has arranged to charter the Vision boat for a 3-day/3-night dive trip to the Channel Island Marine Sanctuary in mid-September when ocean conditions generally tend to be very good. Please join us for a chance to dive Santa Barbara Island, as well as the northern islands (such as Anacapa, Santa Rosa, Santa Cruz, and San Miguel Islands - sites and islands will be based on weather/marine conditions), all for the price of $580.00. We plan to start our trip with visiting Santa Barbara Island, .the smallest of all of the California Channel Islands and the southern-most island in the Channel Islands National Park. 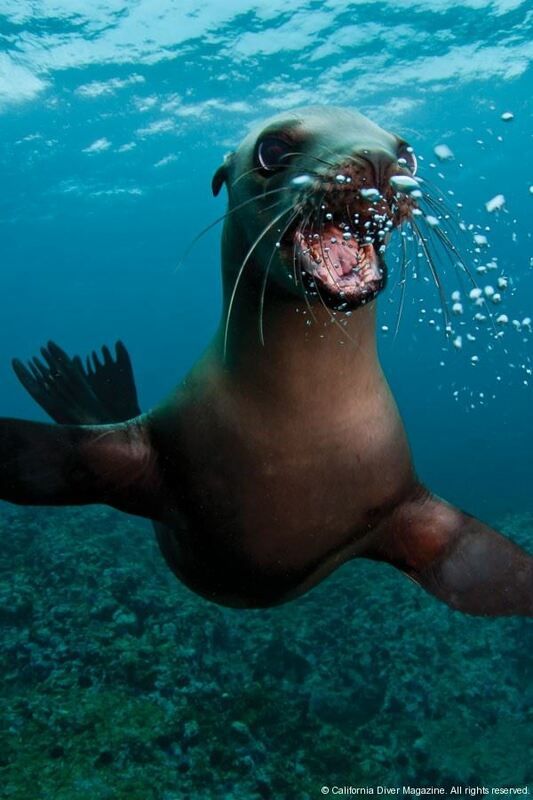 Santa Barbara Island is best known to divers for its guaranteed sea lion encounters. The island also has phenomenal reefscapes and kelp forests too. Santa Barbara Island can be some of the best scuba diving found offshore but if conditions are rough there are not many areas to seek shelter. Because of its small size, ocean swells can wrap around the island, so planning a trip is weather dependent. If the knowledgeable Truth Aquatics crew determines that ocean conditions are not suitable for diving Santa Barbara Island, we will then only dive within the northern chain of the Channel Islands National Park. Divers will be refunded their share of the fuel charge if we must cancel visiting Santa Barbara Island due to ocean conditions. After our visit to Santa Barbara Island, we will then head north to dive within the northern chain of Channel Islands (Anacapa, Santa Cruz, Santa Rosa and San Miguel Islands). Each island offers a different and unique collection of sea life so even the most discriminating diver can find a variety that will keep them entertained. All accommodations are on board the Vision. The price includes all meals and snacks for 3 days, and air fills. Divers should bring ALL their gear, including one tank and weights. Gear can be rented from SEA Landing, conveniently located on the Vision's dock. Nitrox is available on the Vision at an additional cost (click here for details). Gratuities are not included (recommended gratuities are 15-20%). Alcoholic beverages are not available for purchase on the Vision, but you can bring your own. The dive trip on board the Vision will normally spend the first day at the listed destination, and then slowly work back through the Northern Islands visiting different spots along the way. Our plan is for a 3-Day trip where we will dive Santa Barbara Island on day 1, and the Northern Islands on days 2 and 3. This process makes for the most varied and interesting diving. We will depart port the evening of September 14th so that we may start diving the morning of Thursday, September 15th. Five dives a day are possible including night dives, except Saturday where 3 dives are possible before returning back to port in Santa Barbara. Water temperature can vary up to 15 degrees from the Northern and Southern ends of the island chain with an average of 50-60°F in winter and 60-70°F in summer. Diving can be challenging at times. Prior cold water experience is strongly encouraged. Note that the dives from the Vision are not guided dives. You must be able to plan and execute your dives independently. If unable to register enough people, we may need to explore other options, e.g. a half charter or cancellation. If we have over 26 registrants, there will likely be a refund of any surplus funds. Please note that we have signed a contract to charter the Vision, and registered participants will not be entitled to a refund if you wish to cancel. You are responsible for finding a replacement. Please read carefully the terms and conditions for all NCRD trips. The Vision is part of the Truth Aquatics fleet, and thanks to regular updates and maintenance, it is a world-class liveaboard diving and excursion vessel. Details on the boat are available here. The Vision is also equipped with kayak racks for storing kayaks or paddle boards for non-diving passengers. Divers will be given their choice of bunk based on whether they will be sharing a bunk and when they signed-up for the trip. The earlier you sign-up, the more likely you are to get your preferred bunk. There are no private cabins or en suite baths. The sleeping area is a large bunk room. The restroom and shower area is shared. The Vison will depart Santa Barbara Harbor on Wednesday, September 15th, at 1:00 AM. for the overnight ride to Santa Barbara Island. Boarding will be allowed from 8PM of September 14th, until departure time (1AM of 9/15/16). Santa Barbara, which is only 350 miles south of San Francisco -- an easy and relatively inexpensive 6-hour drive from San Francisco, especially for carpoolers.